After a month of superhuman effort and not nearly enough sleep, last week we closed on my parents’ house, which my family moved into in 1980, when I was in eighth grade. In early December, my siblings and I accepted an offer on the house that gave us a mere three weeks until the projected year-end closing date to get everything out of the house. I had no idea how we were going to accomplish this feat – only that it would happen because it had to. And it did. Although it took place at warp speed – or perhaps because it did – the process was an intense journey of love, reflection, and clarity from which I emerged with some fresh stories to share. The morning after we accepted the offer, I felt stunned. I recalled the scene in Titanic in which the builder of the ship realizes it’s going down and that in a matter of hours, everything in the ship will be at the bottom of the ocean. That scene summed up how I felt about the reality that all my parents’ material belongings – absolutely everything they accumulated throughout their lifetime – would be gone by the end of the month. As I lay in a comfy bed in the guest room of the home they filled with so much love (and stuff) over the past 36 years, it seemed impossible that all of it would be gone soon, and only love and memories would remain. After my mom passed away in May 2014, her possessions remained essentially untouched. We hadn’t gone through any of her clothes or personal items, although last winter my dad started talking about how we needed to take care of her clothes and have a yard sale. But it didn’t happen. So for 2½ years, we were spared the grim task that we suddenly had to face head-on, that made grief feel brand-new again, as if an old scab had been torn off. But it wasn’t all sad, for such times are opportunities to realize that you are not alone and that there is a handful of gracious people willing to step forward and help, even right before the holidays, during winter storms, and when you’re sick with possibly the worst cold you’ve ever had. People who will think for you when your mind is foggy from said nasty cold and provide emotional support when they notice you’re feeling overwhelmed. People who will work for days sorting through and arranging stuff throughout the house, including a frigid garage. People who show up with a truck and move very heavy furniture into storage for you because (according to them) you are worth it. Times like this serve as a beacon that illuminates where love and nourishment exist in your life – and where they don’t. You notice who shows up, who you can depend on, and who you can’t. The people who stepped up to help inspired me to reflect on the relationships I devote the most energy to. When there is so much love and light available, why settle for anything less? The helpers in our lives teach us how to be kinder and more generous and considerate of others in their time of need because we realize how much it matters and that interdependence is the basis of our human existence. It’s one thing to know that with your mind and another to experience it as a living truth that beats inside your heart. The silver lining to the gut-wrenching job of preparing for a rushed estate sale and clearing out my parents’ house was spending time with my sister and daughter, sharing interesting discoveries and memories with them and others who leaned in and formed a caring circle around us. I came across so many long-forgotten treasures. Some finds, such as the sheet music from my very first piano lesson in third grade, made me wistful and compelled me to reflect on roads not taken and crossroads where I allowed fear and lack of confidence to get the best of me. Holding the music in my hands filled me with the same excitement I felt at eight years old, when I received my first, official piano assignment. The whole process was like a great life review, two months before I turn 50. I realized that the choices I’ve made have resulted in so much unnecessary suffering, hardship, and limitation, and life didn’t and doesn’t need to be that way. So I resolved to turn it around from this point forward by making better choices, believing in myself, and not selling myself short. I realized that all along, it was my own mind that set me up for failure and suffering. And it is my own mind that can set me free. I felt my parents’ presence more than ever once all their possessions were out in the open, and I saw objects that generated so many memories. There was my mom’s sewing machine, sewing notions, fabrics, and the dress patterns she sewed for my daughter. I regretted not asking her to teach me to sew. She taught a friend’s daughter how to sew after the friend passed away, and that should have been my cue to ask her to teach me. I came close a few times, but life was busy, and I ignored the little voice inside that urged me not to put it off. To save it or to get rid of it: that was the question. My old (circa 1975) calculator, for example, was an interesting conversation piece that I found in my dad’s dresser. It had been left behind on an airplane one day, and my dad had first dibs on it and would be able to bring it home if it remained unclaimed after a certain amount of time. I so hoped it could be mine because I wanted my very own calculator – and they were new, exciting, and expensive back then. I loved the green, glowing numbers! Holding the bulky, vintage calculator in my hands brought the story to life more vividly than merely describing it from memory. But is it necessary to hold onto the objects, or just keep the stories? Might a photograph or video suffice and save space? There were stories, moments, and memories attached to so many objects in the house. Now there is nobody left to tell many of the stories, so if I don’t know them by now, I never will. I think back to when I did a screen recording of my parents talking about old photos five months before my mom died and how grateful I am that we did that. Perhaps my son could shoot some video of me showing and telling about the objects I came across in my parents’ house that sparked stories. Together, we could create a video heirloom of family history. It’s important to share our stories and to listen to the stories being shared with us. They help us, respectively, to review and make sense of our lives and understand where we come from. The night before the estate sale, I cried three times. The first time was when I opened a tin of my grandfather’s things, including what appeared to be an engraved wedding band, and reflected on all my relatives who have passed on and how short a lifetime is and what we leave behind – and the meaning of the trinkets that get passed down through the generations, as well as the gesture of saving them. The second time was when I opened a box of my parents’ friends’ obituaries that my dad had clipped from newspapers. So sad. So much loss. So sweet that he did that. When I looked through the box, I found my mom’s obituary, which he had printed from the Internet, and was overcome with sadness because it must have been so hard for him to add that obituary to the box. I could feel his sadness so strongly. The third time I cried was when I discovered yet another dresser full of personal items at 10:00 PM when I was exhausted and sick, and my tennis elbow was flaring so badly that it hurt to even brush my teeth, and I needed to get to sleep to be ready for the sale in the morning! Actually, there was a fourth time, too, when I checked the weather forecast before going to sleep, for the weather gods were not smiling upon us that weekend. After our rather disappointing attempt at an estate sale that wintry weekend before Christmas, the next step was to rent a large dumpster and box up items to be donated. This involved a final walk-through to decide what I really wanted to save from the landfill. It was the last chance before these items would be gone forever, a process of looking and listening for which items spoke to me, which ones seemed to want to be saved, which ones I might regret letting go of so hastily, and which ones my parents would want passed down – keeping the reality of limited space in mind. And then came the realization that possessions really didn’t matter, and what our parents would want most was for the three of us to treat one another with kindness and respect. I felt them guiding me. Ultimately, it wasn’t about the stuff. It was about the memories, relationships, and the qualities they modeled and inspired in us. It was also time to attend to boxes of personal artifacts that had been set aside because they were not part of the estate sale. One day, I came across two boxes of particular significance, one right after the other. The first contained every printed program in the history of the Saratoga Performing Arts Center, where my mom worked for 40 years. Many of the covers were so familiar that they brought me back in time, to when they graced the coffee table of my childhood home, and I read them from cover to cover. The feelings these programs stirred up were admiration and respect for my mom, who was a VIP staff member at SPAC and was literally my ticket to all the performances. I felt strongly connected to her and grateful that she encouraged me to be musical. Then there was the second box, which had the opposite effect. It contained my mom’s Eastern Airlines recruiting and training materials that listed physical requirements for flight attendants, including specific body measurements and height requirements. My mom loved being a flight attendant in her 20s and bought into the whole airlines fashion culture. She met my dad when she worked for Eastern, and he worked for Mohawk. She had to give up flying when I came along and eventually returned to work as a recruiter. Coming across the Eastern Airlines materials helped me put into perspective my mom’s ideas of what a female should look like and aspire to and all the body shame I experienced growing up because I was such a sensitive soul – the shame that caused me to decline my sister’s invitation to be her maid of honor because I couldn’t bring myself to wear a dress I knew I wouldn’t feel comfortable in, that might leave me open to critical comments from my parents. Even though I realize my mom was a product of another time and meant no harm, I can trace most of my “issues” back to that box and have a certain, ceremonious fate in mind for it. The two boxes summarized perfectly the dichotomy that defined my relationship with my mom and the complex dynamics of the mother-daughter relationship. Even when we do our best, sometimes we end up unintentionally hurting those we love the most. And on the flip side, what we perceive as criticisms from which we need to protect and defend ourselves can blind us to the love and light that’s coming a hundredfold from the same person. We might fixate on the negative and fail to see the positive – and cut ourselves off from the good stuff, which is unfortunate all the way around. There were so many boxes. When I opened up yet another box of meaningful newspaper clippings, cards, plane tickets, programs from school music concerts and recitals, etc., I was at the same time completely overwhelmed by the sheer amount of stuff my parents saved and deeply touched by how loved we were that they saved everything that had anything to do with us. It was amazing to hold objects in my hands and feel their emotional charge and realize I’d been carrying those feelings inside me all these years. Uncovering such objects activated old feelings but also allowed me to interact with them in a greater context, with the experience and wisdom of an adult rather than a child – which was very healing! The process of clearing out my parents’ house led me to discover how sentimental they were. Seeing what they saved revealed their sweetness and the depths of their hearts. I understood how much they loved each other and that love was the fundamental nutrient I was raised on. I found a box of my grandfather’s reel-to-reel recording tapes. One of them includes a recording from the day I was born and many recordings of me when I was very young. It was really touching to find them and to know that my grandparents were so excited about my arrival that they started making recordings the day I entered the world! I didn’t have to do anything or be anything in particular to be loved and celebrated. I just needed to show up, to just be me. That’s a mighty realization! That night, I drove home listening to the radio, and when a love song came on, I imagined my parents and grandparents singing it to me when I was a baby, which was really powerful. A deep shift occurred inside me when I listened to the song in that way. I’m so grateful for all the time I had in the house before it was transferred to the new owner. Observers might have thought I was depressed, but that was not the case. I was on a deeply spiritual, healing journey and sought closure the best way I knew how: by leaning in and listening to the tender places. Unearthing hidden treasures. Even when only a few boxes remained in the house, I’d stop by to do yoga and take a nice, hot bath. I still found it comforting to be there, even though the house was silent and empty of everything except for the bathtub and major appliances. 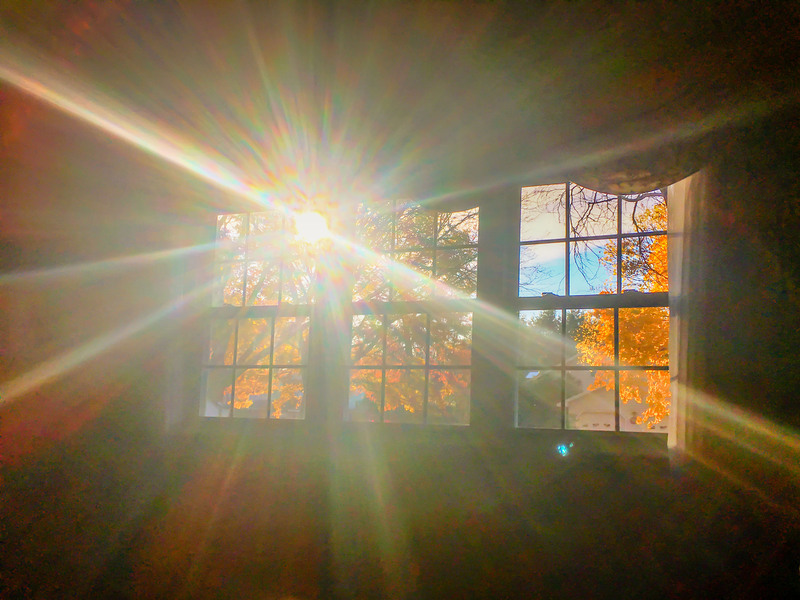 The empty rooms mirrored the inner clearing process I’m undergoing as my clarity deepens in response to grieving multiple losses, and I work on releasing what no longer serves me in the days leading up to my 50th birthday. It was interesting to notice what memories arose when I stopped and took in the energy of each room. The rooms were full of memories. Light still graced the empty spaces. After everything had been cleared out, only the energy remained within the walls…and it was exquisite energy, so peaceful and nourishing. The night before the closing, I had a white, jasmine-scented candle glowing on top of the stove and basked in the energy all night under the full moon in my little makeshift bed in the living room. While sweeping the bathroom the next morning, I thought about how I would go forth and integrate what I found and saved from my parents’ house into my own life. In time, I will figure out how all the objects and the stories attached to them will fit, and I will decide what to keep and what to let go of and just hold onto the stories – or even rewrite them in some cases. Then I did a goodbye walk-through. I stepped through the front door and remembered how my mom would greet me with a big hug and smile and the aroma of something yummy in the oven, like a birthday cake or macaroni and cheese. I paused in the family room, where we opened Christmas presents, and the TV was always on. This is the room in which I watched Downton Abbey with my mom and then with my dad after my mom had passed, and where I visited with my grandparents and so many other relatives and family friends through the years. I went through each room, allowing the memories to arise and honoring the space that held them. When I got to the master bedroom, a heart-shaped rainbow appeared on the floor where my mom’s bed used to be. The night before the closing, when I was going through the very last box in the house, I felt a nudge to ask my daughter if she’d like to come over the next day to say goodbye to the house. She immediately replied, “Yes, I do!” In the morning, before taking my last shower in the house and doing my goodbye walk-through, I paused to look out the bathroom window at the back yard and remembered how my dad scattered some of my mom’s ashes in a special spot. It occurred to me that I hadn’t scattered any of his ashes there, and that needed to happen so “they” could be together there as part of the land. Later, when I picked up my daughter and granddaughter, I realized I forgot to get my dad’s ashes when I stopped home. So I called my son to ask him to meet me at my parents’ house with the ashes. As it turned out, my last moments in the house were spent with both my children and my granddaughter. (It reminded me of the night my mom was dying at Gateway House of Peace, and my son and daughter had an ice cream party and movie marathon in one of the upstairs bedrooms and made a sad situation feel more like a celebration.) Little Ava, who will celebrate her first birthday this weekend, was crawling around exploring the house and then had a dance party with my son, with lots of laughter. It was wonderful. Then I thanked the house and its energy (which felt like it was ready to move on), closed the door behind me for the last time, pulled out of the driveway, honked the horn, and waved at the house with my daughter and granddaughter – who represented my future – in the car with me. It was the perfect ending to a 36-year chapter. It was totally unplanned, but that’s the kind of magic that happens when you follow those nudges of intuition and take some time to pause, reflect, and listen. I realize that if all these endings and challenges hadn’t happened at the same time, I probably wouldn’t have gone as deep and been able to work on some firmly rooted programming from way back when that no longer serves me. I trust the role that pain and grief play and am filled with gratitude and astonishment. At the end of this chapter – the one in which I had parents and a home in which I grew up that is now empty space and memories – I have learned so much about love, on so many levels and in many different contexts: What it is and what it isn’t, where it comes from and where it doesn’t, why I am capable of loving and caring so deeply, and how to love better, including loving myself (which might sound like a selfish thing but couldn’t be further from that). It’s amazing what you can discover standing in a huge dumpster filled with memories. You might find you are surrounded by more love than you ever imagined possible – and that you always have been, even when you convinced yourself otherwise. In the end, I realized the Eastern Airlines box was quite small relative to everything else. I remembered that I am Nancy and Ed Meyer’s daughter and my grandparents’ granddaughter, and I am worthy of love, no matter how I look or what I do or don’t accomplish. I need not spend my energy regretting or being ashamed of paths taken or not taken or berating myself (or allowing anyone else to berate me) for my perceived shortcomings, mistakes, and failures. And because of that realization of my inherent worthiness (and yours, too), I resolved not to settle for any less going forward – from another person or myself. I am also Jasmine and Cianan’s mother and Ava’s grandmother, and the better I feel about myself, the better I can love them and support them in their journeys. As the above picture of Ava suggests, when one door closes, another one opens. Life is for the living. Even though our lives are interdependent and interrelated and ultimately united at the core, a week and a half after the closing, it feels like I’m finally returning to my life and goals, after several months of attending to sooo much else. Back to that business I was trying to develop last year, that book I am intent on publishing, decluttering my house, getting more and better quality sleep, and filling the empty spaces with my own dreams and goals. And so…onward, feeling a bit more whole and shining a little brighter. Onward to the grocery store, for I have a birthday cake to make for a wide-eyed, one-year-old girl. Happy New Year! I hope 2017 is off to a bright and hopeful start for you. It’s been a month since I’ve written a blog post because immediately after publishing the last one, we accepted an offer on my parents’ house, and the world started spinning faster than ever! We accepted the offer on December 7, which included agreeing to close by December 30. Well, on December 7, everything my parents owned was still in their house. To say the house has generous storage space is an understatement, and their belongings filled up all that space. We had on our hands the accumulated possessions of a lifetime – and not only their lifetime, but my grandparents’ lifetimes, as well. There were boxes upon boxes of my grandparents’ things that appeared not to have been touched since the day they were brought into the house. It became obvious that my parents saved everything. And that made for a ginormous job for us, during the holiday season, no less. There was only one weekend available before the projected closing date to have an estate sale: the weekend of December 17. I had met with a woman who organizes and runs professional estate sales, and she told me to get back in touch with her when we have a buyer. Then we wouldn’t have to worry about staging the house for showings anymore and could organize for a sale. However, given how soon the closing would be and the time of year, that option was out. So I researched how to run your own estate sale, took copious notes, and researched values of things, while working around the clock hauling items and boxes out of the far reaches of my parents’ storage spaces to see what we were dealing with. I had no time to price things, so almost everything was “make an offer.” And in the midst of that inhuman workload, I came down with my first cold in at least four years, and it was a bad one. I was sick for 12 days straight, including the weekend of the sale, when I could barely talk above a whisper! AND there was a snowstorm that weekend, which made driving perilous. And of course, it was the last weekend before Christmas, as well, so people had lots of other things to do besides help with or attend an estate sale. However, a few angels showed up and helped me organize for the sale and were on hand during the sale for moral support. I couldn’t have done it without them – or even come close! Needless to say, the outcome of the estate sale was disappointing. If we had more time to work with, or if it were a different time of year, it would have been a completely different story. At the end of the weekend, aside from getting rid of some furniture, it looked like we had as much stuff left as we had begun with. So then we started bagging and boxing donations. My sister rented a dumpster, and I rented a self-storage unit to literally buy some extra time to sort through things at a more leisurely and mindful pace. Let me tell you: They were the craziest weeks of my life. I intend to write more about the whole experience because there is so much to say about it. But for now, I want to focus on the piano. The Mehlin & Sons 1954 spinet piano was my mom’s first big purchase when she was working at her first job at General Electric after graduating from high school. She was passionate about music and taught herself to play. 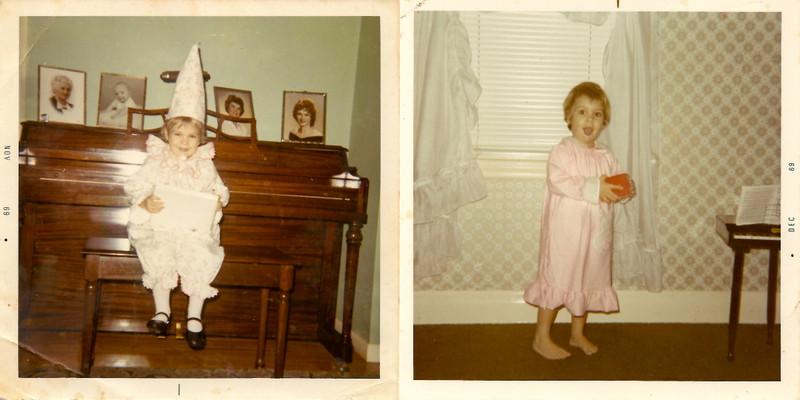 When I came along, she bought me a toy piano (pictured partially below) that I adored, and I became fascinated with “the big piano” and couldn’t wait until I could learn to play it. 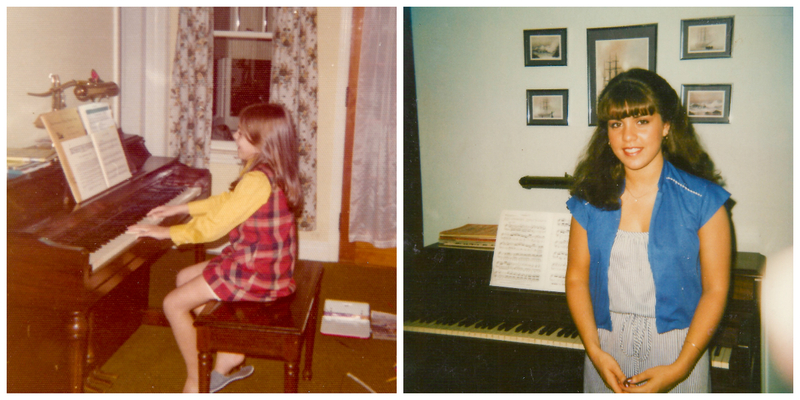 I started taking lessons in third grade, and piano quickly became not only my passion but also my identity. My mom was delighted. She worked at the Saratoga Performing Arts Center and arranged for me to interact with dozens of classical pianists and musicians through the years. When she thought my motivation to practice was waning, she asked Andre Watts to have a little talk with me. I met Liberace more than once and babysat for Emmanuel Ax’s son, which involved interacting with Mr. Ax both before he left for the performance and when he arrived back home. In high school, I was piano accompanist for school choral groups and played piano (and marimba) in jazz band. 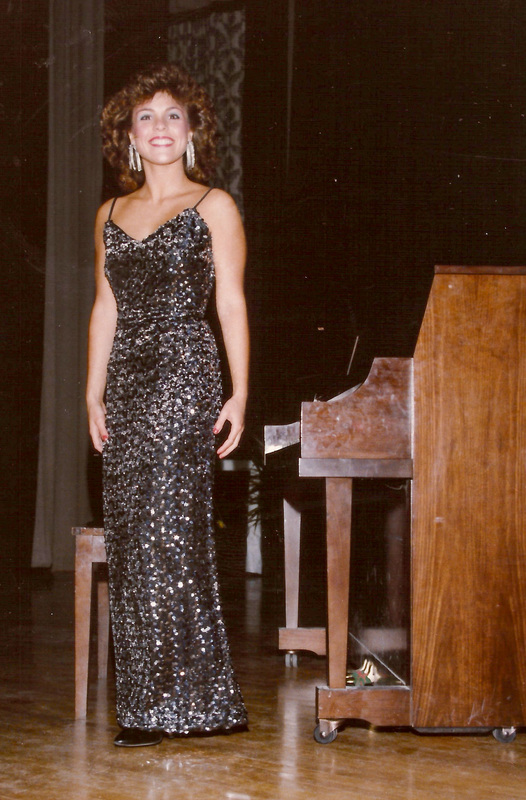 I accompanied vocalists outside of school, played for weddings, and even competed on piano in the local (county level) Miss America pageant at age 19 and won the talent competition (which was the only reason I was in it). Piano was the first Great Love of my life. It turned out I didn’t have the confidence or resilience to pursue a career in music or even major in music in college, and that is something I still regret. And stage fright was an issue, too – because I was playing for the wrong reasons. I was more focused on impressing people (including pleasing my mother) and doing it “right” than on expressing the music in me. I think I also was not playing the kind of music that resonated most with me – which I know now to be more meditative, flowing, and New Age. I remember how I dreaded being called on to solo in jazz band because improvisation felt too personal and vulnerable. It felt safer to play the notes on a printed page – someone else’s music. I went to Ithaca College, a school known for its excellent music program, where I majored in psychology. When I took a piano performance class with music majors, I felt like I was out of my league and dropped the course. I’ve continued to play now and then through the years, but just for fun and relaxation and almost never in front of another human being – although there have been very occasional jam sessions that felt really good. However, when I’m playing (often with headphones so nobody can hear me), there’s no feeling quite like it. I feel totally in the flow and joyful. It feels as if, in those moments, I am doing the thing I came here to do (i.e. be my authentic self), especially when I have no music in front of me and play from my heart. So I guess you could say that I’m quietly picking up the broken pieces of my abandoned talent and putting them together in a more authentic “Zen and the Art of Piano” way. 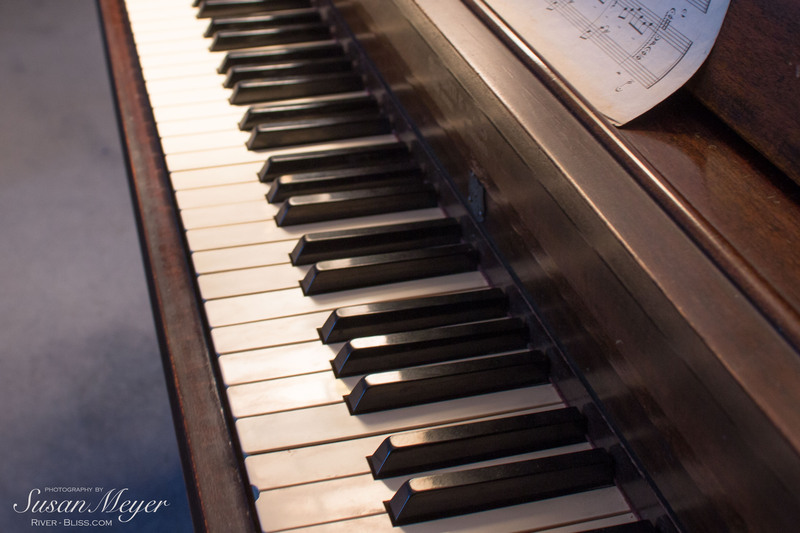 I have other Great Loves now – namely photography and writing – but piano remains my first, and first loves can be especially powerful and hold a special and enduring place in our heart. So I married a man with a music degree, and after we got divorced, I married a professional musician who doesn’t read music and is all about improv. My daughter took piano lessons (which my parents paid for) and played my mom’s piano, and my son taught himself and played it, as well. One of the most poignant memories during the last few weeks of my mom’s life was on Mother’s Day, when the house became quiet and heavy with the realization that she would be gone soon. My daughter broke the heaviness by going to the piano and playing “Hallelujah”, and my mom made her way to the living room with her brand new cane, to sit close and listen. So that Mehlin & Sons spinet piano means a great deal to me. It was my first Great Love and possibly the deepest connection my mom and I shared. It filled her with such joy to hear me play it and to fall as deeply in love with it as she had. I wished I could keep it, but I couldn’t because I don’t have the space or any kind of storage area for it. So it became important to find the right home for it. And when the right person approached me and expressed interest in buying it for her son and granddaughter, I could not put a price tag on it. The personal value was too great to be measured, and it felt better to give it away to a good home. Two days after Christmas was the Big Day when the piano movers were scheduled to take the piano to its new home. Although I hadn’t planned anything beforehand, I woke up early that morning knowing exactly what I needed to do before going to work. I jumped out of bed and into my car and drove to my parents’ house to play a final, private concert for my mom on our piano. All that remained in the living room that morning was the piano, a lamp, and an easy chair – which was perfect for such an occasion. The piano needed to be tuned but always had such beautifully weighted action. (I will miss that familiar touch so much.) And I knew exactly what song to play: “Flying Free”, a choral arrangement with a simple, flowing piano accompaniment that I hadn’t played in many, many years. When I asked what I should play, that song came to me so clearly and instantly that I didn’t question it. It was neither challenging nor impressive – in fact, I considered it “easy” when I played it back in seventh grade – but it was a song that always felt soulful and uplifting to play and that I could play through inevitable tears. Even the lyrics (though I was too choked up to sing them) were perfect on so many levels. After all, discovering and expressing my soul is what my relationship with piano has been about all along. It’s a path that wouldn’t work if it was based on comparing myself to others rather than being truly inspired. It needed to be authentic and include music and mentors who stirred something in me and led me to the threshold of my soul, where my own music resides. Improv, the thing that scared me most, is perhaps what I needed most to learn, to take me to another level where I could feel and express the music flowing through me more authentically. And that’s something I can still work on when I’m alone with my keyboard and headphones – although I yearn to ditch the headphones at some point and not give a damn what anyone will think or whether I’m “good enough” to be heard. Playing this farewell concert was what I needed to do to honor my relationship with this piano and with my mom (who gave me the gift of music for which I am so grateful) the best way I knew. I cried a lot as I played, but it wasn’t because I was sad or depressed. It was because I was expressing what was alive and real in me, rather than pushing it down and denying it. When you are able to risk being emotionally open and vulnerable, you can go to some incredibly beautiful and transcendent places and flow with the music within you that longs to be set free. It was like making love to a cherished lover for the last time. As I played, I imagined for a fleeting moment that I was back in high school, practicing piano while my mom was in the kitchen making dinner after getting home from work. The house was filled once again with love, light, warmth, cozy furniture, framed art on the walls, and the comforting aroma of my mother’s cooking. Even though she didn’t particularly enjoy cooking, my mom was happy listening to my pre-dinner music. But mostly I allowed the music to flow through me like a prayer. A somewhat out of tune prayer, which was actually a lovely testimony to the instrument being played and loved through the years. When I closed the cover over the keys for the last time before leaving for work, it was like closing the lid to a coffin and saying a final farewell to a dearly beloved person. I caressed it, patted it, gave it a kiss, thanked it, thanked my mom. Two hours later when I was at work, my sister texted: “Piano is gone.” I blinked back the tears that would flow like a waterfall after I got out of work and was alone. At least I know who my beloved instrument has gone to and feel that it has found its way to its next rightful home. I hope that if the new owner ever decides he no longer wants it, he will contact me, and maybe I will be in a position then to take the piano back. But if not, at least I got to say goodbye to it for real and play a last concert for my mom. A friend suggested that perhaps my dad was there, too, and they were dancing in the room as I played. I love that idea. I hope they danced. A few days later, on New Year’s weekend, the new owner sent me an email expressing his gratitude for the piano. It included a picture of him and his young daughter sitting “at the helm of our new treasure” with their hands touching the keys. The little girl was beaming. It was the perfect closure for me and the perfect ending to a very difficult year. 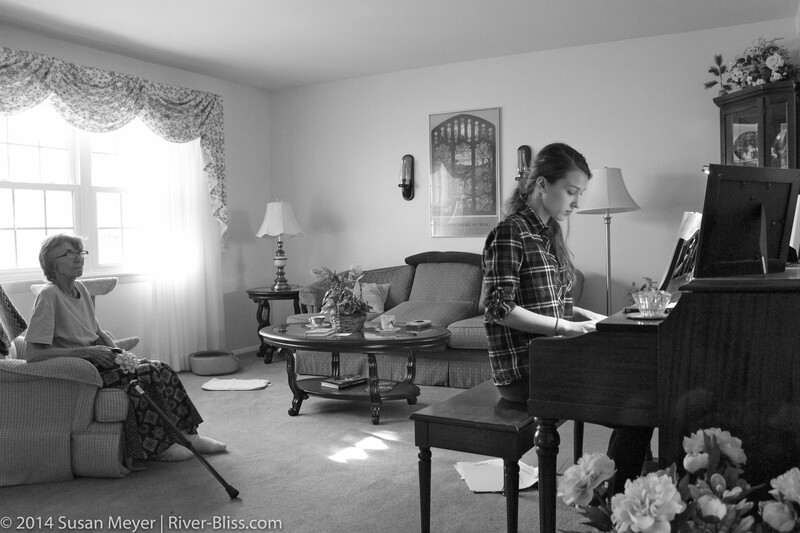 That piano was the most cherished of all my mom’s possessions, and she would be so pleased to know that a young girl will be able to enjoy it now and learn to play on it, just like I did. And so am I.
P.S. Since I very rarely let anyone hear me play, it was terrifying for me to share online the humble, imperfect recording of me playing my mother’s piano for the last time!! However, a voice from deep within insisted that I must. So I did. And it felt like recovering a very significant part of myself that had been banished for a very long time. It felt like healing! I remember the first time I was overcome by a wave of grief after my mom died. It was when I walked by a children’s clothing store in Bennington, VT that I thought she would find delightful. And then it hit me that I couldn’t tell her about it. And I cried, right there on the sidewalk. It happened for the first time with my dad recently when I was at work. A friendly, elderly man came into the library limping a bit. He said hello, smiled at me, and reminded me of my dad. Fortunately, I only had five minutes left at work and was able to keep it together that long. But as soon as I got inside my car, I lost it. I can align myself with a more expanded, “spiritual” awareness much of the time, but it can be so sad on a personal level, and some moments and events catch me off-guard. That night, I fell asleep with a question in my heart: How do you handle such grief? The answer I received: Hold it differently. Hold it differently. But don’t try to bypass it. Feel its weight, its shape. Examine it from different angles. Get to know it. Don’t be afraid, for it comes bearing gifts. I’m not psyched to go through this all over again, so soon. I’ve grown weary of goodbyes. But that’s life. People come and go. It’s something we all go through. I’d rather feel grief deeply and fully and have the scars to show for it than not experience the love and caring that precedes it. I’ve come to realize that mourning life’s inevitable losses is a wondrous opportunity to grow in compassion, empathy, love, and wisdom. It is an invitation to wake up. A dark blessing that expands and connects us. If we accept the invitation, ultimately we learn that we are so much larger than our grief. I’m also re-learning that grief is hard work. Physical work. The waves that come along and knock you to the ground are physical, not just emotional. You have to find your balance and strength to stand up again as the waves continue to exert their force on you, leaving you disoriented. You have to find your footing because the alternative is to be pulled out to sea without anything to keep you afloat. It’s interesting to have powerful experiences that feel like communication with the other side of the veil and still be knocked off-balance from missing the physical presence of a loved one who has crossed over. It’s not a question of having enough faith, for the purpose of faith is not to bypass challenging emotions such as grief. Rather, faith is like a life vest that helps us to stay afloat when we are knocked off-balance by a big wave. It assures us that we are bigger than whatever loss we are grieving and that we can handle it. It won’t kill us. It can lead us to discover and develop inner resources. That is so hopeful and exciting! We can hold our grief differently, and that doesn’t mean pushing it away or internalizing admonishments to “get over it” and move on, for grief follows no timetable. It means having a different perspective regarding the purpose that grief and loss serve in our life – and that they even have a positive purpose to begin with. I see all my recent losses as a tremendous invitation to expand and grow my soul and hopefully inspire others to do the same. I’m grateful for all the experiences I’ve had, including and especially difficult and challenging ones because they allow me to do my work in this world better than I could do it without them. They have been my impetus for awakening. This is perhaps the biggest “aha” insight I’ve had thus far in my life. It is revelatory! As I actively experience grief, it is my intention to explore it with all my senses rather than flee from it. To be curious about it. I want to learn all I can from it, for the better I come to understand my own suffering, the better I can connect with the suffering of others. I invite it to teach me and grow me, to link me with others, and transform me into something more magnificent than I was before. We live our lives on multiple levels, which is why we can hold a loss in our heart and feel it deeply while simultaneously trusting in Divine Timing and sensing that in a much, much broader context, all is well, all is evolving, and we are part of it. For example, it is possible to feel that it was my dad’s time in a spiritual sense while also feeling sad about losing him and upset about the circumstances. Inside bereavement there are a number of rooms – different spaces we can settle into. There is the room in which you miss your loved one’s personality and physical presence acutely. There is a room in which you sense everything is unfolding according to Divine Order, and there are no accidents. There are other rooms, as well. You can sit in one of the rooms and then discover there is a movable wall separating two rooms, and you open it and find yourself sitting in a more spacious awareness in which you can be in both rooms at the same time because there really is no separation between the two. Imagine the room of Acute Grief being dark and cold and not having its own heat source, whereas the Serenity-Faith room has a cozy fireplace and windows that allow in plenty of light. When you open up the wall between the two, the heat from the Serenity-Faith room warms up the Acute Grief room. In this space, I realize it wasn’t just my dad’s time. It was my time, too. My time to become more and grow exponentially while my feet are still walking on this earth. You can stand in the middle of the two rooms and be in both environments at the same time and feel your heart simultaneously breaking and expanding. You can perceive your sorrow from a much greater perspective while also acknowledging the pain. And this allows you to sit a little longer in the grief room and to be mindful of what’s in there so you can learn more about it and transform it with presence into wisdom, compassion, and other spiritual blessings. That’s something you can’t do when the wall that separates the two rooms is in place, making the grief room too unpleasant to stay in for more than a brief moment and motivating you to seek shelter and distraction elsewhere. I am certain this situation did not present itself in my life to weaken or diminish me, but so I can learn from it. So I can expand, awaken, and love better. Challenging times invite us to cultivate inner resources. We can’t let our sadness, upset, etc. get out of control and drown our light. We are called to channel our painful emotions and become greater versions of ourselves. To discover what we are capable of. There have been some mighty strange goings-on in my world since my dad died three weeks ago. I’m writing this just in time for Halloween, although the timing was not at all intentional. Until this morning, I thought I’d keep my experiences to myself, but after talking with some friends and tuning in to my intuition, I decided to share them in as straightforward a manner as possible so you can draw your own conclusions. Be sure to read all the way to the end! There have been a plethora of problems with electronics. Three different keys to two different cars haven’t worked at certain times, and I’ve had phone connection issues that I hadn’t experienced before. While creating the photo slideshow for my dad’s funeral services, I experienced a series of at least 20 bizarre technical glitches that I’d never encountered before. And last week, this very blog sent out a post from several months ago to email subscribers without any action on my part. I didn’t even know it was possible to resend an old post and was surprised to see it in my inbox! My daughter and son were in town for my dad’s funeral two weeks ago, and after the service, we met at my house before they went their separate ways, back to Georgia and the NYC area. As they were leaving, I turned on the light on the side of the house so they could see better as they drove away. I went to bed just before 10:00 and fell asleep instantly. When I woke up in the middle of the night, I glanced at my phone to see what time it was and noticed a text my husband sent at 10:22 PM asking me to turn out that light because he was sleeping in the RV, and the light was bothering him. So I went downstairs to turn off the light but saw that it was already off. I assumed he had come inside and turned it off himself. The next morning, I asked him about it and explained that I didn’t receive his text until the middle of the night. He was really surprised because no sooner had he sent that text, and the light went out. It went out so immediately that he found it odd because he wasn’t even sure he’d had time to hit “send”. I also found it odd but didn’t want to jump to conclusions and suspected the lightbulb might have blown out at an uncanny time. So I went over to the light switch and was surprised to find it in the “off” position. As soon as I flipped the switch, the light went on – so it hadn’t burned out after all. It just happened to turn off at the exact moment when Jack requested that I turn it off. My dad passed away in the morning. That evening when I was at my parents’ house with one other person, we saw a swirl of mist traveling around the kitchen, followed by a significant drop in temperature in the room we were sitting in. At the funeral service at the church a week later, something caught my eye as I greeted the continuous line of people coming to pay their respects. Again, I saw a white mist moving around high above us. It was an overcast/rainy afternoon, and it wasn’t caused by sunlight coming through the windows. My parents loved to travel during their 50 years of marriage and especially enjoyed vacationing in the Hawaiian Islands. There is an “aloha” ornament hanging next to their front door, which has been there for as long as I can remember. One morning last week when I was meeting an old friend at the house for official business, I arrived to find “aloha” on the welcome mat in front of the door. The hook was still hanging next to the door, and when I examined it, I realized there was no way the “aloha” piece could have been knocked to the ground by the wind or even a person (and certainly not an animal) because it was in a very sheltered, recessed spot, and the hook itself was angled upward enough so that the ornament wouldn’t fall off. The only way “aloha” could have ended up face-up on the welcome mat between the time I left the house the night before and arrived early the next morning is if someone had removed it from the hook and physically placed it in front of the door. The person I was meeting was someone my mom adored, and it felt like she and/or my dad were saying hello and expressing approval of him being our realtor. Just then, the grandfather clock – which hadn’t worked in years – made a soft chiming sound from across the room. It was not on the hour (6:05 – not the correct time), and I hadn’t heard that clock all day or for a really long time – months or even years, for that matter. The chime sent chills down my spine. Alarmed, I texted two close relatives, and right after sending my text, the clock chimed again. Then I noticed my cell phone battery was getting low, so I got up to retrieve my phone charger, and when I walked through the kitchen, I heard a fast ticking sound that I hadn’t heard before then. 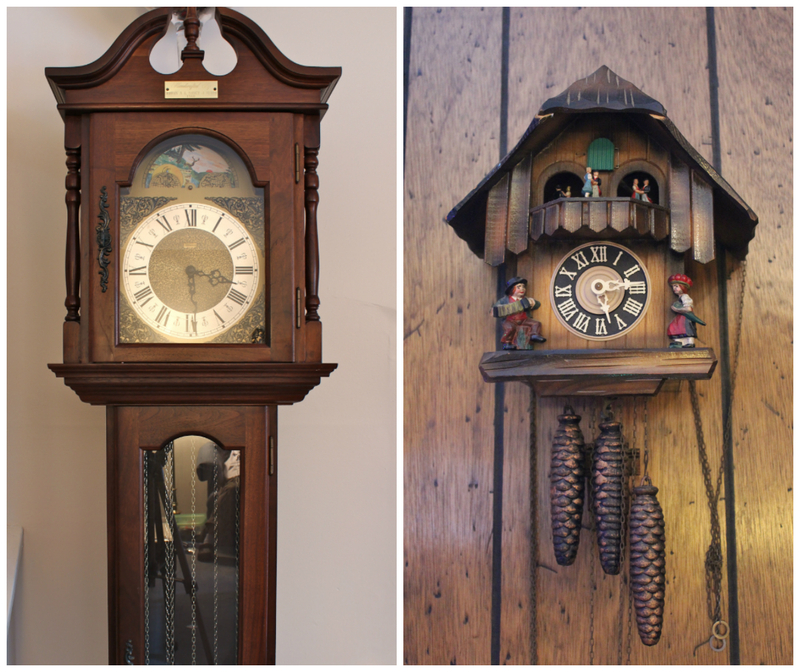 It sounded like it was coming from the direction of the cuckoo clock in the family room, and when I went closer, I realized the cuckoo clock – which hadn’t worked in decades – was ticking! Again, this was a clock that had been dormant for a long time, and it just started ticking all of a sudden. At this point I was quite spooked! Not just one, but two clocks had come alive simultaneously! Even though I was startled and shaking, I sat back down on the couch to see if I could become still enough to pick up on any messages that might be trying to come through. I said, “OK, you have my attention!” and became still and silent, imagining white light surrounding me and filling the room. Then I heard my dad’s voice talk to me inside my head. He sounded happy and spoke in the voice he used when he was relaying a funny story or a story of something peculiar that had happened to him (like when my mom’s grandfather came to him in a dream shortly after he died, and when my mom came to him in a dream some time after she died). He said he was with my mom…AND THEN THE CUCKOO CLOCK CUCKOOED FROM THE FAMILY ROOM!!!! It seemed he wanted me to pass along a message to my sister, who was at his bedside constantly for the last 14 or so hours of his life and was quite shaken by the whole experience. I said out loud to confirm, “So you want me to tell her…” And then the cuckoo clock cuckooed again! At that point, my shaking hands texted another relative to ask if she’d experienced anything at the house, and she texted me back, saying she had experienced something with the cuckoo clock and her cell phone playing a tune (ringtone) she’d never heard it play before when she sat in my dad’s chair, which really freaked her out. Even though I still felt alarmed, I had to laugh because it was comforting to feel that my parents were there with me and to think of how entertaining it must be to make the clocks go off. It seemed to me that making the clocks sound was like making the telephone ring and wondering if somebody would pick up and answer at the other end. And I did. I continued to have a conversation with my dad in which I told him that I’ll do my best to listen if he tries to get in touch with me and that dreams are usually a good way to communicate if he knows how to do that. Then I told him that I’m going to get going now…and the cuckoo clock cuckooed again! When I stood up to leave, the (landline) phone rang, and I was afraid to answer it! But I did. Nobody was on the line when I answered. No clicks or anything. Just silence. I said hello at least three times before hanging up. I had been at the house for more than eight hours, and the phone hadn’t rung a single time until that moment when I got up to leave. After leaving the house, I called my daughter to share the experience with her, and she reminded me that the only other time she’d heard the cuckoo clock sound was right after my mom passed away. I’d forgotten about that. But at the time, it seemed like a big deal. At this point, I want to clarify that I don’t drink or do any drugs. (I don’t even drink coffee!) I don’t have a psychiatric diagnosis and am not committed to the notion that hearing my dad’s voice inside my head was actual after-death communication with a deceased loved one, although that might be the personal meaning I ultimately derive from it. It could be me working things out inside my own head. Conversations with my higher self. Wishful thinking. Or…who knows what? The way I see it, if you can arrive at some kind of resolution, answer, or insight that truly feels right in your heart and leaves you feeling at peace, it doesn’t matter where it came from. It is part of your healing and growth. I can’t claim to fully understand what I experienced. I certainly know what it felt like and am open to other explanations and possibilities. But in the end, the meaning I make of it is my own, and all I know for sure is that it’s part of my experience and that it left me with a sense of hope, comfort, and peace once I got over the initial shock. On the morning of that same day, I had an intriguing dream in which I was standing on a bridge and was drawn to stunning orange foliage on trees across the river. Then I noticed the trees moving together in a strange way: First the branches stretched out to the sides and then moved upwards so the foliage was a little higher up from the ground. The trees went through the same movements a couple more times, and each time the leaves traveled higher up toward the sky. When I woke up from that dream, I felt a little peculiar. I recalled three other dreams I’d had of nature acting in a bizarre way that captured my attention and felt that something was attempting to get through to me. I sensed it might have had something to do with my dad. It wasn’t until I told my sister about the dream later in the day that I realized I was standing on a bridge in the dream. The dreams I’ve had of contact with deceased loved ones always have some kind of boundary like that. So when I had the experience with the clocks later that day, the dream felt even more significant to me. I told a couple of friends about my experience and explained, “Well, it’s the time of year when the veil is thin” and recalled writing an article with that title last year at this time. This morning, I pulled up that post and was astounded to read about a similar dream that also began when I noticed beautiful autumn trees. To be honest, I wasn’t really thinking of sharing these experiences until I read that post from last year and remembered that sharing my experiences is something I need to keep finding the courage to do without worrying about being judged because that kind of sharing is my path. Everyone is entitled to his or her own opinions and theories, and I’m just sharing my experiences without any embellishments or exaggerations, in case it’s helpful to anyone. I’ll let you decide what to make of them.